Homeopathic acne tablets offer an individualized approach to treating acne, treating the “whole person,” not just the symptoms. 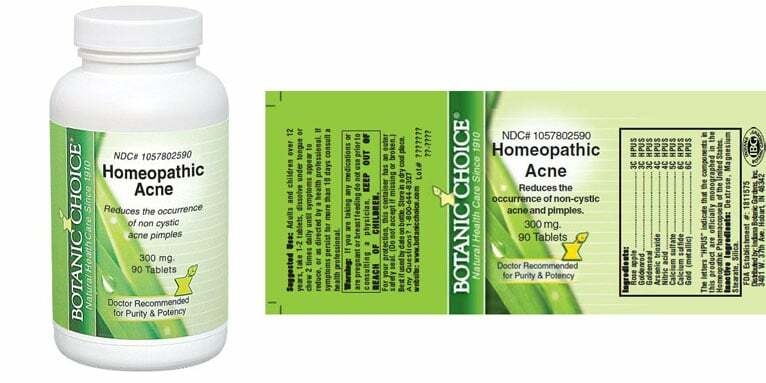 Homeopathic acne tablets offer a highly individualized approach to treating acne. Homeopathy treats the “whole person,” not just disease symptoms. A homeopathic remedy may improve other “whole person” symptoms before it begins to resolve acne. A homeopathic tablet has been “imprinted” with the energy of a toxic substance. Every time the toxin is diluted, the energy of the substance is stronger. Some remedies are diluted as many as thirty times, leaving just a few molecules of the original ingredient. The body senses the “energy” of the healing substance as not being itself, and learns to reject the symptoms caused by it. As unlikely as it sounds, homeopathic acne tablets actually work—and also relieve symptoms you may not have realized it was possible to treat. Homeopathic remedies are almost always dispensed in the form of tablets. The principle of homeopathy that most people have heard of is the idea that an inert substance can be “imprinted” with the energy of a natural treatment over and over again, each time with a smaller and smaller physical concentration of the active ingredient. A 1C homeopathic treatment has been diluted one time and contains 1/10 of the original active ingredient. A 2C homeopathic treatment has been diluted ten times and contains 1/100 of the original active ingredient. By the time a homeopathic treatment has been diluted 6 times it is usually thought to be mildly effective, and a 30C dilution, containing just 0.00000000000000000000000000001% of the original active ingredient, is usually reserved for the most severe cases. But there is another side to homeopathic treatments that most users of homeopathy (and most critics of homeopathy) don’t know anything about. The ingredient that is selected for the treatment of an illness reflects the needs of the whole person. A homeopathic doctor attempts to identify the “miasm,” or primary derangement of the life force, that keeps a person from being well. Every miasm can be the root cause of several different disease. The miasm that causes frequent infections and irritability might manifest itself as acne, or it might manifest itself as asthma, or chest colds that leave a rattling cough, or chicken pox. These symptoms might be worse when the individual is under stress, or angry, or cooped up indoors. Then the homeopath chooses a substance that would cause all these symptoms if given to the patient. Antimony poisoning, for example, causes skin inflammation and trouble breathing and mood swings. The homeopath imprints the energy of antimony over and over again to make a 12 C or even 30C homeopathic remedy that contains almost nothing of the original substance, but that carries the energy of the toxin. Taking the homeopathic remedy then teaches the body that the energy of the substance does not belong to the body, and neither do the symptoms associated with it. Does this sound like a crazy theory? Well, maybe it does. But homeopathy often works. Antimonium tartaricum matches the acne symptoms described above. It is also recommended when hydroquinone treatment has left bluish marks on the skin. Calcarea carbonica is actually a homeopathic rendering of chalk dust. Just as real chalk dust would trap sweat, calcarea carbonica has the energy of trapped sweat. As the body learns to recognize that this energy is “not self,” it is less likely to form body acne under tight garments or athletic gear. Hepar sulphuris calcareum is a remedy that starts out as oyster shells treated in sulfuric acid. If you were to take this compound without dilution, it would cause no changes at all until all the symptoms happened suddenly. People who have tend to be perfectionists, or who have a “long fuse” before they explode in anger, or who have acne that tends to break out over night are treated with this remedy. It is also used to treat boils, folliculitis, and impetigo. Pulsatilla is a flowering plant that is native to Sweden and Finland. Bearing purple flowers on stalk with silver-tinted leaves in the spring and summer, it is also known as silverweed. For over 2,000 years it has been used to treat eye infections. In homeopathy, it is used to treat people who are easily moved with emotion, “people who need people,” and people who like sweets but who dislike spicy or fatty food. The kind of acne this remedy would be used to treat is premenstrual acne in women, or whiteheads and blackheads in men. Silica is the mineral in sand. During the day, sand is dry. Overnight, it may become wet. Sand is a very weak building material. As a homeopathic remedy, silica is used to treat conditions that cause “leakage” at night, whether this leakage is a bowel problem or a skin problem. It is also used to strengthen weak nails, hair, and skin. Sulphur is pungent. It is yellow. It tends to release fumes. Can you guess what kind of person gets homeopathic sulphur? In addition to treating flatulence, homeopathic sulphur is also given to people who are generous but unmotivated, intellectual but disorganized, and who tend to perspire and give off fumes. It is used to treat acne problems that have resisted other treatments and flaking skin. The best way to use homeopathic acne tablets is to choose one of these remedies that seems to match your whole-body symptoms. Take one pill and wait a day. Take another pill and wait another day. Then start taking two pills a day and see if any of your symptoms improve. You may experience improvement in symptoms that are not related to your skin health before you experience improvement in acne. And you will still need to do daily cleansing of your skin and regular toning and exfoliation.